I like the song Classical Conversations has for memorizing the states and capitals. I also like the fact that we are starting out just going down the east coast. But there can never be too many memory helps. 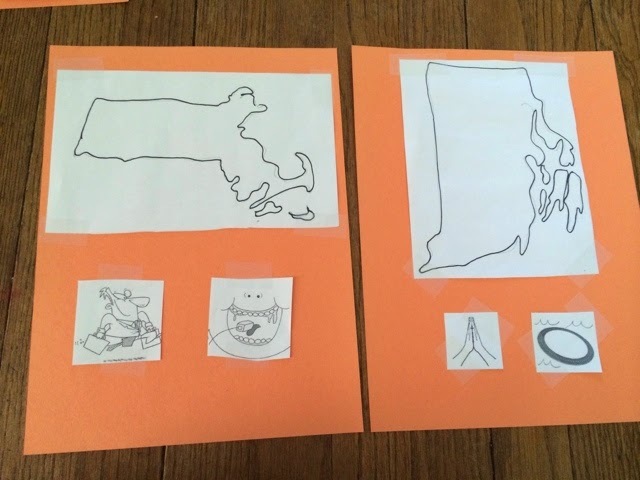 I put together some "flashcards" with the outline of the state and two picture "helps". One picture for the capital, one for the state. Here's how you can do it, too. Real simple, real quick. 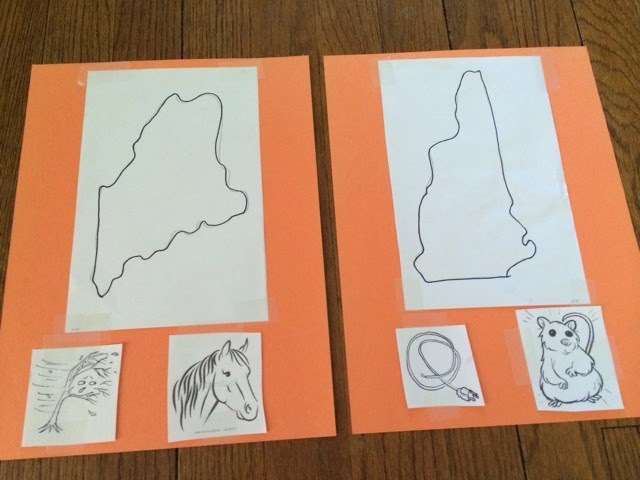 Google " Maine outline map image" and you get several to choose from. Click on one. Click "view image". 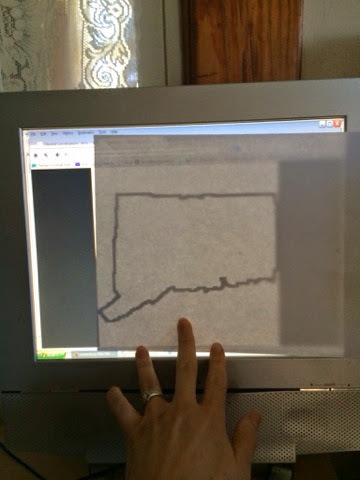 Hold a piece of printer paper in front of the screen- presto quickest light table for tracing. I did it this way so I could make it my own size and right on the paper where I wanted wihout messing with sizing and layout... Took a couple seconds and I didn't waste time or paper. You could simply print. But I'm also trying to print as little as possible, and don't we encourage our students to trace maps ;). Then I did print some little images for the helps underneath. Cut them out, and tape them to a large construction paper. I thought I would do each week in a different color paper. In a couple weeks they can use the large flashcards for a review game/activity. Also great for my kids to trace at home. 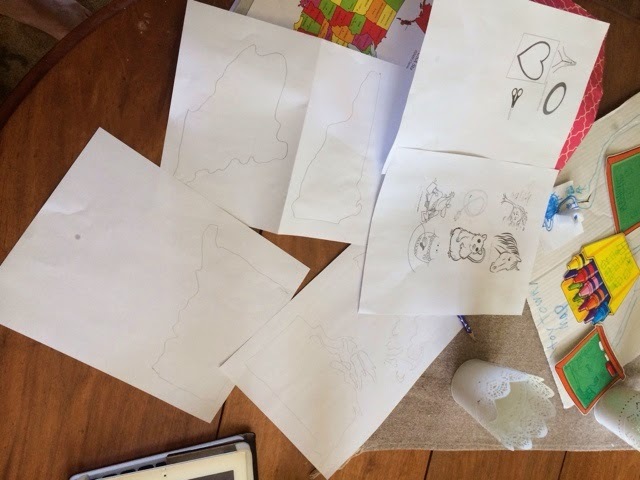 Here are the pencil outlines of the states, one per half sheet of paper, and the little memory help images. Rhode Island - this is a road in a circle I drew waves around. A road island. I plan to show the large map provided by my director. Point to the states and say the names and capitals. Then have them locate the area on their map. I'll get out my large flashcards, explain the helps. 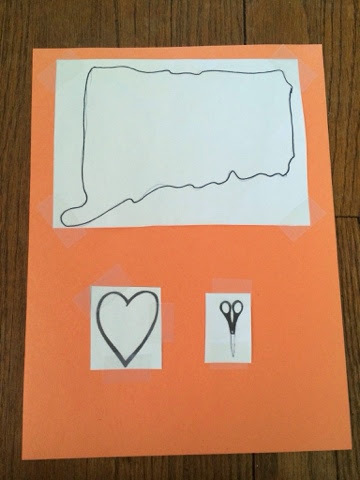 Then I'll hold up a flashcard and have the kids point to it on the map and say the name and capital. We'll squeeze the song in, too. We'll see how it goes week one. My kids thought the pictures were funny and seem to have held onto their meaning. If it works, I'll probably do it again, though some states or capitals might be harder to come up with helps. Two posts in one week- What!?!? I love these! Wondering if you have done any more? Just finding this and tomorrow starts week 2 for us. Thanks for sharing!